Lumber contains tight, sound knots throughout. A soft, relatively low-strength, straight-grained, even-textured wood. Works well with hand and machine tools, but sharp cutting edges need to be maintained to prevent tearing the grain. 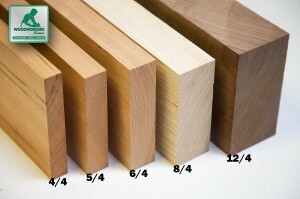 The wood is rarely wider than 6 due to the small size of the trees. The actual footage you receive will be slightly different from what you order, therefore your final billed amount will be a little different. This is because we hand select your lumber from inventory of various widths and lengths - every board is unique and different in size (except thickness). 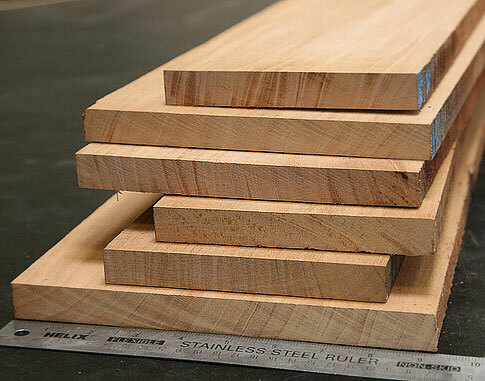 Knotty Alder lumber comes in random widths and lengths, with a uniform thickness. Also known as 6/4, S2S. Surfaced 2 sides (S2S) from rough sawn lumber. You should be able to yield approximately 1-1/4" thickness after you flatten, plane, shape or sand your project parts to fit your project. Moderately durable, yet lightweight with an even color, you can use alder for furniture and cabinetry. 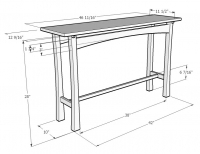 The tight grained wood is easy to work and goes easy on your tools. Use a clear finish to achieve a mild color that's darker than maple yet lighter than cherry; or stain it for a rustic 'old world' look as this wood takes stain unevenly, which creates a dramatic effect for those with that taste. A relatively small tree, reaching about 50ft in height and producing a trunk in diameter up to 15". Rustic furniture, entry doors, moldings, turning, carving, toys, plywood, veneer, cabinets, musical instruments. What Does 6/4, S2S Mean? I ordered 100 feet of this product with other lumber. Wood was wrapped carefully and all wood was straight. No warp. Will definately order from you again. Nice rustic wood I will use to make 2 doors so the water and electric meters can be read on my mobile home.